After taking over the D50 project from Lancia, Enzo Ferrari was busy turning the newly-acquired Grand Prix racer into a “trump card,” and Scuderia Ferrari was heading for a very successful season in 1956. 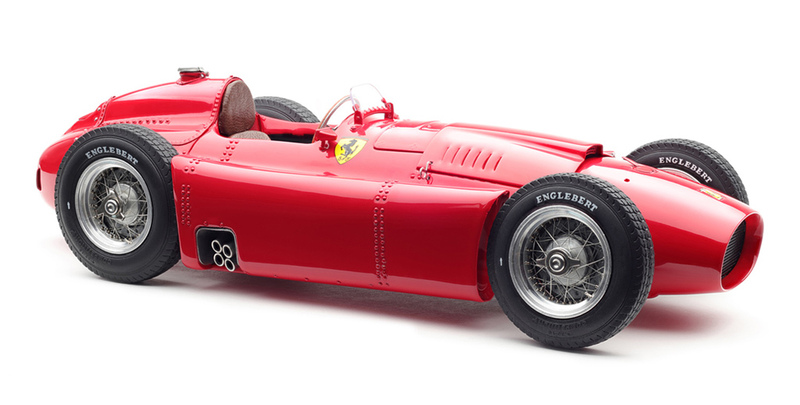 You are looking at a standard version of the newly-renovated Ferrari D50 with a short nose. CMC will also offer a long-nose version that prevailed at the 1956 German Grand Prix held on the Nürburgring. The tragic loss of Ascari shortly after the 1955 Monaco GP meant, besides exposure to a rapidly worsening finance, an early end to the ambitious F1 project of Scuderia Lancia with its D50’s. It also marked the end of Gianni Lancia’s dream to stay competitive, if not victorious, in the highest form of motorsports. On July 26, 1955, there was a hand-over of the D50 blueprints, tooling, manufacturing equipments, and lots of parts from Lancia to its most covetous competitor, Scuderia Ferrari. Ferrari introduced an overhaul of the D50. It brimmed with brilliant renovations, hence putting the new D50 on a path of destiny towards triumph. The two pannier fuel tanks that were positioned astride the mid-section of Lancia D50 were replaced by a single fuel tank placed directly behind the driver’s seat. The bodywork was extended to encompass the two independent spaces once occupied by the pannier tanks, and the more integrated body shell provided better aerodynamics. Down below, behind the left- and right-side panels were two bundles of exhaust pipes, each with four pipes that were bent to protrude before the rear wheel, emitting both exhaust and distinctively Ferrari roar. The maximum output was increased to 265 hp, and further enhancement was possible by changes of cylinder heads, valve control, crankshaft and pistons. The two oil coolers between the pannier tanks and the body shell were abandoned for a tube oil cooler installed in front of the radiator. Modifications were introduced to the tubular frame and the suspension systems, including the relocation of the rear transverse leaf spring to a higher horizontal position. The tires were switched from the Pirelli brand to Englebert. Eventually with a total of five Grand Prix victories to his credit, Juan Manuel Fangio was able to finish the 1956 season by clinching his fourth Drivers’ World Championship.